Good old William. Since 1934, William Hill has been a fine institution of British bookmaking and sports betting, and of late, William has got slightly more adventurous in his travels, expanding into foreign markets with his highly influential online sportsbook. William is known for his superior standards of excellence both on the high street and the Internet, and his sportsbook experience is one of luxury and class. Much of this is to do with market research – William has researched well, and caters for all kinds of gamers, gamblers, sports betters, and online casino fans. He anticipates your needs and desires, and understands the business so well, because most of the team members are punters and gamblers themselves. This attitude has won William a raft of prestigious awards over the years, including Top Sports Book 2011, Best Odds 2012. Sports betting is at the heart of the William Hill empire, and the range of bets has recently been expanded. Because William offers so many markets, the firm processes more than 1 million betting slips each day. William Hill is possibly one of the most progressive sportsbook sites, certainly when it comes to being available to players globally. The firm services almost 180 countries, with depositing options in around 12 currencies. Bet via multiple channels – in shop, telephone, online, and mobile. William's progressive outlook on technology is apparent too, as you'll find many options and extra features unavailable elsewhere, such as live-match betting and betting on the 90th minute of televised football, directly from your mobile or PC. If you fancy playing the games while you're waiting for the match to start or the horses to run, then look along the top of the page for quick links to casino, poker, Vegas, live casino games, bingo, virtual, financials, and mobile gaming. One account gives you access to William's entire product suite, so toggling between markets and games is a breeze. William Hill plc is one of the biggest bookmakers in the United Kingdom, and listed on the London Stock Exchange. As if that wasn't impressive enough, the firm is also a constituent of the FTSE 100 Index. As of summer 2013, it had a market capitalisation value of £4.07 billion. The company was founded in 1934, when gambling was illegal in Britain. William promises never to forget this long heritage – after all, he has spent nearly 100 years building his honest, trustworthy, and knowledgeable business. William Hill must throw one enormous Christmas party, as the company employs over 17,000 people in nine different countries. That's an awful lot of vol au vents. 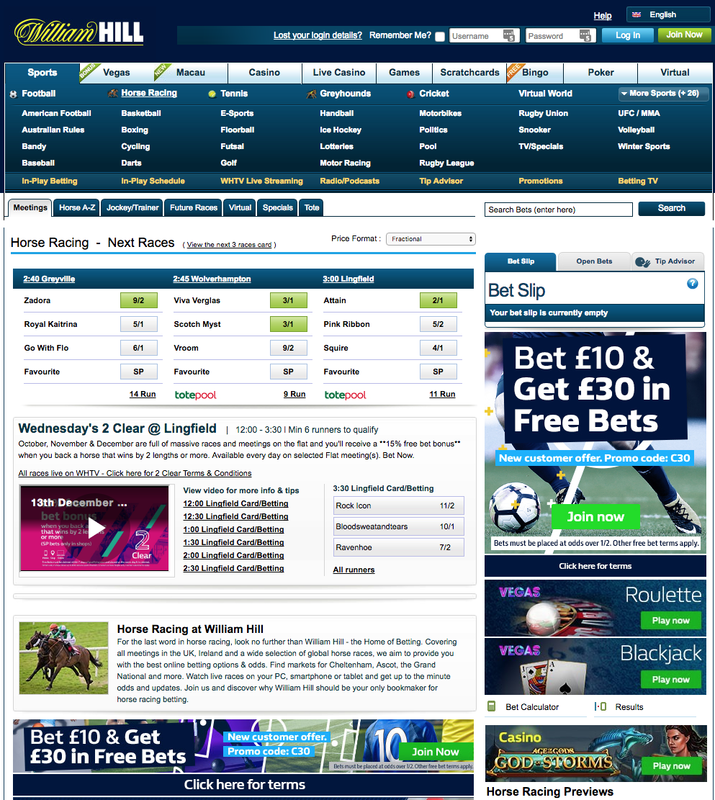 A visit to the William Hill website is a classy affair – the regal fonts, sensible blue and white colour scheme and well-planned navigation make it a breeze to find what you're looking for. Having said that, the layout is slightly different from most sportsbooks, but it doesn't hurt to be unique in a crowded market. Find hot links to in-play betting, live TV streaming, radio and podcasts, plus the essential Tip Adviser. It's definitely worth checking the News Section, where William's journalists update the latest odds and tips. At time of press, there were 717 markets available, on 43 events, playing across seven different sports. Toggle between fractional odds, decimal odds, and American. William Hill is operated by WHG, registered in Gibraltar, and licensed by the Government of Gibraltar.